The importance of regulation was the topic of the day as industry heavyweights joined current and former regulators at Bloomberg’s bitcoin conference yesterday. Bitcoin: Beyond the Currency, held at the organization’s global headquarters in New York, drew an audience of roughly 200, many of whom were investors and other denizens of Wall Street. Former SEC chairman and recently appointed advisor to BitPay and Vaurum Arthur Levitt told the audience that there is a lot of work still to be done on bitcoin’s image to take it into the mainstream. Other panelists echoed the concerns about bitcoin’s image problem, but also spoke much more positively about the role of the digital currency in financial services and other uses of the technology underlying bitcoin, the blockchain. The first panel, ‘Bitcoin as a Technology’, featured Chain CEO Adam Ludwin, BitGo CEO Will O’Brien, Ribbit Capital partner Nick Shalek and Blockchain president Peter Smith. Bloomberg Television tech reporter Alex Barinka moderated. Ludwin kicked off proceedings aiming to dispel any notions that bitcoin and the blockchain could be separated. He addressed the Goldman Sachs report on digital currencies issued earlier this year which expressed interest in the blockchain, but not the digital currency. Smith called it a “fashionable” sentiment in the FinTech community right now. He added that, while the world has previously had ‘digital abundance’ and even ‘infinity’, the notion of ‘digital scarcity’ was only introduced five years ago, by bitcoin and its units. 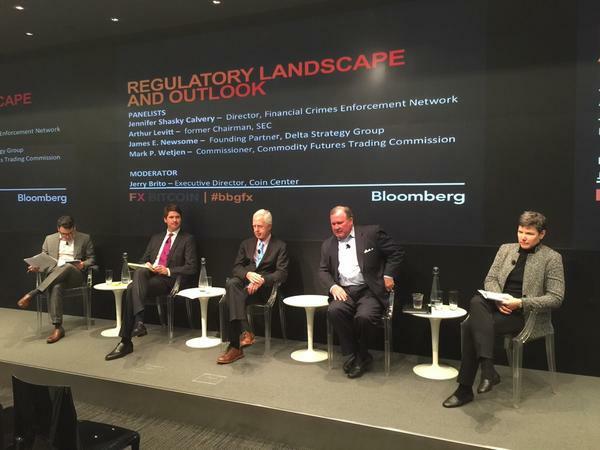 In their closing remarks, each of the panelists mentioned regulation as at least one of their biggest concerns for the industry going forward. Notably, O’Brien added that the industry will be “fractionalized” by local regulators and local movements “dislodging” future innovations. Shalek offered the opinion that banks and regulators will spend too much time waiting for the other to take the lead. Taking part in the ‘Payments and Service Providers’ panel were Circle co-founder and CTO Sean Neville, Stripe head of digital currencies Christian Anderson, BitPay co-founder and executive chairman Tony Gallippi and BitNet CEO John McDonnell. Bloomberg Intelligence senior financials analyst Alison Williams moderated. Anderson said that it’s important to “tease apart” regulation and consumer protection, as it relates to “trust brands” – the ones that give consumers the confidence to use products and services. Consumer protection, he said, can be accomplished without over-regulating trust brands like Visa. “The more interesting conversation is going to happen … around the concern of regulators that criminal activity is going to somehow run through these digital currencies. Evoking one of Ludwin’s points from the first panel, BitNet’s McDonnell said that the answer to consumer protection, money laundering, criminal activity or any other regulatory issue can be automated, calling it the “recurring theme” and the “recurring answer” throughout the community dialogue. He spoke of the value of multi-signature transactions that have a service layer that eliminates the need for humans to imbed a smart contract or any other additional feature to do so. While those on the opening technology panel seemed dubious about bitcoin’s regulatory outlook, the regulators themselves were more upbeat. 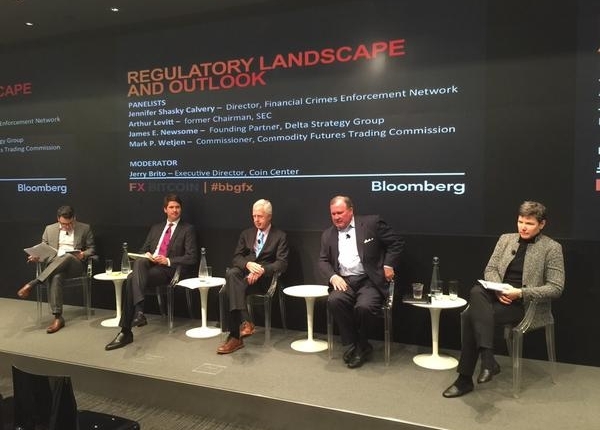 Coin Center executive director Jerry Brito moderated a panel that included former SEC chairman Arthur Levitt, FinCEN director Jennifer Shasky Calvery, Delta Strategy Group founding partner James Newsome and Commodity Futures Trading Commission (CFTC) commissioner Mark P. Wetjen. Levitt said that bitcoin has had many reputational issues and received significant negative attention from media events. The problem and challenge for the industry, he added, is defining what it does and what it will be doing 10 years from now – a definition that could turn public opinion in its favour. Levitt also said his conversations with national regulators, while few, reveal “a real willingness and desire to learn [about] and understand” bitcoin. For the CFTC, Wetjen said, the biggest issue with bitcoin is around surveillance. It’s important and necessary to understand the technology of bitcoin to understand how a swap execution facility and other similar platforms could abide by regulatory obligations, he said. When asked how they envision the bitcoin landscape five years from now, the consensus was “evolved, accepted and regulated”.